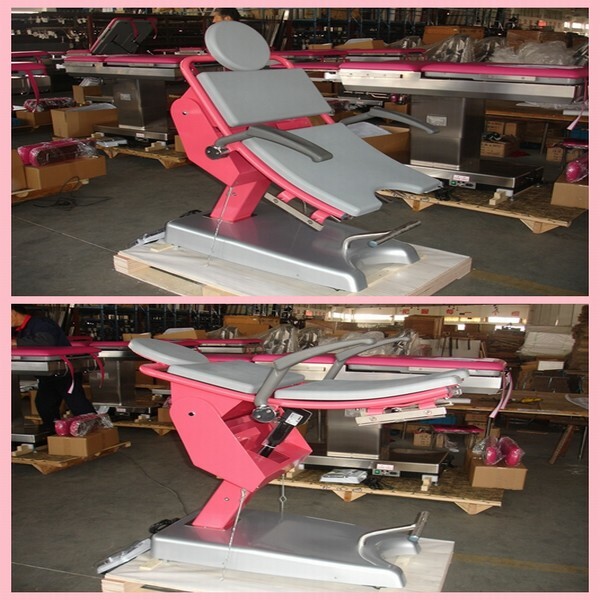 GT-S105A is a new developed ideal gynecology chair. It is with simple construction and pleasing appearance. Head, back and seat section is on a integrate frame, form an arc shape, keep a 40°angle. Height adjust realized by electric though the trendelenburg and reverse trendelenburg. Position change brings convenience for examination and operation. Three section cushions made from foam PU, removable for washing and sterilizing. Electric controlled height adjustment with a wide adjusting range. Min. height allows the patient have her seat easily. Leg support lockable, can turn forward & backward, left & right, height also adjustable. Paper roll below the back section. Basin below the tabletop for dealing with the filth. Foot switch control the movement.